FUSION – Featured eUrope and South asIa mObility Network is an ERASMUS MUNDUS project, co-ordinated by Bournemouth University, UK. It aims to foster partnerships of emerging Asian countries (Afghanistan, Bangladesh, Bhutan, Nepal, Pakistan, China, India, and Thailand) with European countries (Bulgaria, France, Germany, Hungary, Italy, Portugal, Sweden, and UK) to reinforce the existing collaborations developed through the previous EU funded projects. The key objective of the consortium is to enhance the capacity for international cooperation by facilitating transfer of people, know-how, culture and best practice in training the next generation of researchers and academic staff. The mobilities of the first cohort started in 2014. The last mobility ended with the end of the projec on May 14, 2018. The main FUSION administrator from Bournemouth University stayed at the University of Bremen for a staff mobility for two weeks. Read her report here. 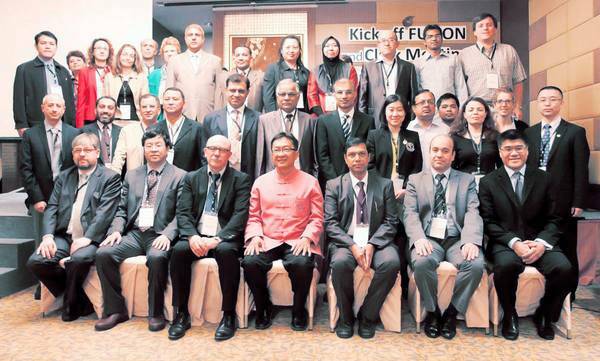 Participants of the cooperative FUSION KickOff and cLINK meeting in Chiang Mai, Thailand, 2013. Erasmus Mundus is a programme of the Education, Audiovisual and Culture Executive Agency (EACEA) of the European Commission. Action 2 supports partnerships with Third Country Higher Education Institutions and scholarships for mobility. FUSION (Featured eUrope and South asIa mObility Network) is under Erasmus Mundus and External Cooperation: Asia Region, (Ref: EACEA/38/12), Strand 1 Lot 11, Grant Agreement No. 2013-2541/001-011-EM, Action 2-Partnerships.